Ofcom has outlined a set of proposals to support long-term investment in full-fibre networks, following the publication yesterday of the government’s Future Telecoms Infrastructure Review (FTIR). The UK’s communications regulator said that “consistent, predictable regulation” over the coming years will help companies like Openreach, Virgin Media, Vodafone, CityFibre and TalkTalk as they build out full-fibre broadband networks. Ofcom’s proposals include providing unrestricted access to ducts and poles owned by BT’s infrastructure arm Openreach, which owns and maintains the UK’s main broadband network. This will allow competing providers to use Openreach’s telegraph poles and underground ducts to lay their own fibre cables, significantly cutting the upfront costs of building full-fibre networks. Currently access is restricted to companies offering mainly residential and small-business services. Ofcom said it also intends to take a “flexible approach to regulation” that reflects how many different competing fibre companies are present in a particular geographic area. Its other proposals include: regulating business and residential markets together, as these services often use a common underlying network; and extending the duration of regulation from three to five years or more to provide longer-term certainty to investors. Ofcom said that its plans are the “next step in the path” from its 2016 Strategic Review of Digital Communications and will help support the government’s plans, which it welcomed. The government yesterday unveiled plans to promote the quicker rollout of fibre broadband ahead of an eventual full switch from copper to fibre. Among the recommendations laid out in the FTIR was an “industry-led switchover” from copper to full fibre that should be coordinated with Ofcom. The review also called for increased spectrum access for “innovative 5G services” and new legislation that will guarantee full fibre connections to new build developments. The government said that the changes it has proposed are essential to: give the majority of the UK population access to 5G; connect 15 million premises to full fibre broadband by 2025; and provide full fibre broadband coverage across all of the UK by 2033. The UK-based Independent Networks Cooperative Association (INCA) – a trade body for next generation broadband services – put its support behind FTIR yesterday, welcoming the emphasis placed on full-fibre, 5G and the role alternative network operators play. INCA’s CEO Malcolm Corbett said that the he expects FTIR to “encourage the deployment of new networks to boost UK-wide competition, leading to wider coverage and much better services for consumers”. 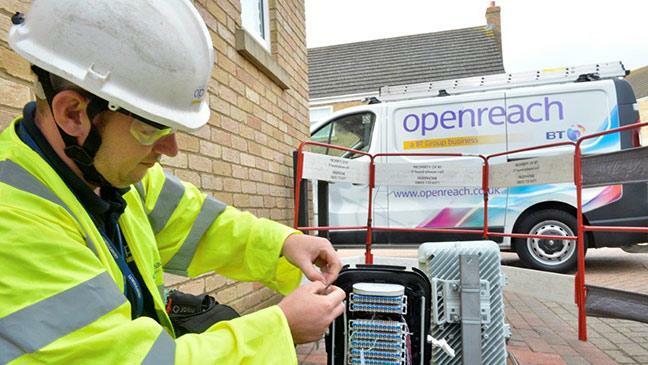 Openreach responded to the developments today by offering long-term discounts on its fibre broadband wholesale prices for all of its communication provider customers – a move it said will give its customers “greater certainty on prices” for a period of three to five years. From August 21, the discounts will available to any business – including small operators – that grows its Fibre-to-the-Cabinet (FTTC) and Fibre-to-the-Premises (FTTP) customer base on Openreach’s superfast or ultrafast network by an agreed proportion over three to five years. “BT believes that the new pricing structure will allow communications providers to encourage more of their customers onto better services and ultimately to move the vast majority of Britain’s homes and businesses onto superfast and ultrafast platforms,” the company said in a statement.